DEWA SANZAN, YAMAGATA PREF. - Even the local residents look surprised at our attire. “Aren’t you cold?” asks a windbreaker-clad hiker. I tighten my happi coat and tuck my leg coverings into my hakama (split-leg trousers) to keep them from flapping in the wind; my multi-layered garb is not only holy but also quite warm. “Um, thanks,” I answer, relieved that I’m not alone in being unaware of the outfit’s significance. Since being dressed in it, I enthused about its novelty and surprising comfort until I discovered the somber meaning behind it: these clothes are designed to resemble robes worn by the dead. By donning the garments, my group and I have symbolically given up our worldly impurities and are now to traverse the three holy mountains of Dewa, called Dewa Sanzan, in order to be spiritually reborn. Each mountain symbolizes part of that journey: Mount Haguro, the present; Mount Gassan, the past; and Mount Yudono, the future. 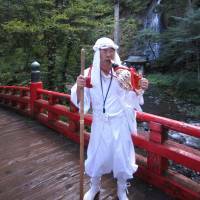 This is the teaching of the yamabushi, the followers of Shugendo, an ancient ascetic religion combining aspects of mountain worship, Buddhism, Shintoism and Taoism. Critical to their beliefs is the pursuit of enlightenment through convening with nature over long periods as well as feats of endurance such as waterfall bathing and walking over fire. 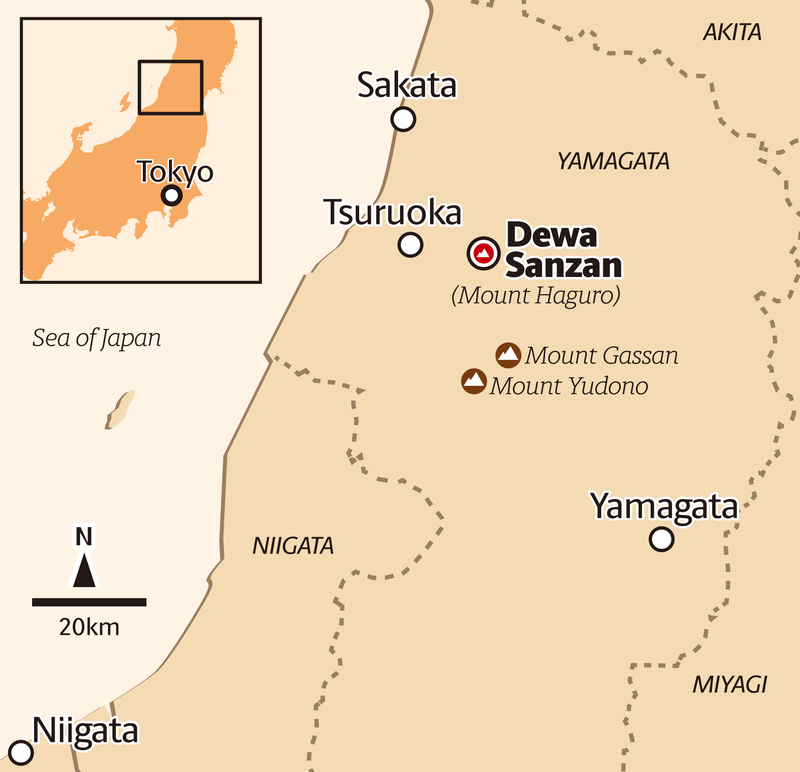 Dewa Sanzan, in Yamagata Prefecture, has been an important center for yamabushi since the beginnings of Shugendo in the eighth or ninth century, although it didn’t grow in popularity as a pilgrimage route for spiritual rebirth until the Edo Period (1603-1868). To this day, each yamabushi in good health is required to make the journey. 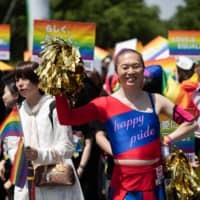 As practitioners have begun to open up their once-private world to outsiders, an increasing number of nonbelievers are joining them, from businesspeople seeking respite from the stress of modern living to tourists and expats keen to uncover a lesser-known part of Japanese culture. And some local residents in Yamagata are working to welcome such people to Dewa Sanzan. We start our journey at the foot of Mount Haguro, the most famous and easily accessible ascent of the three. 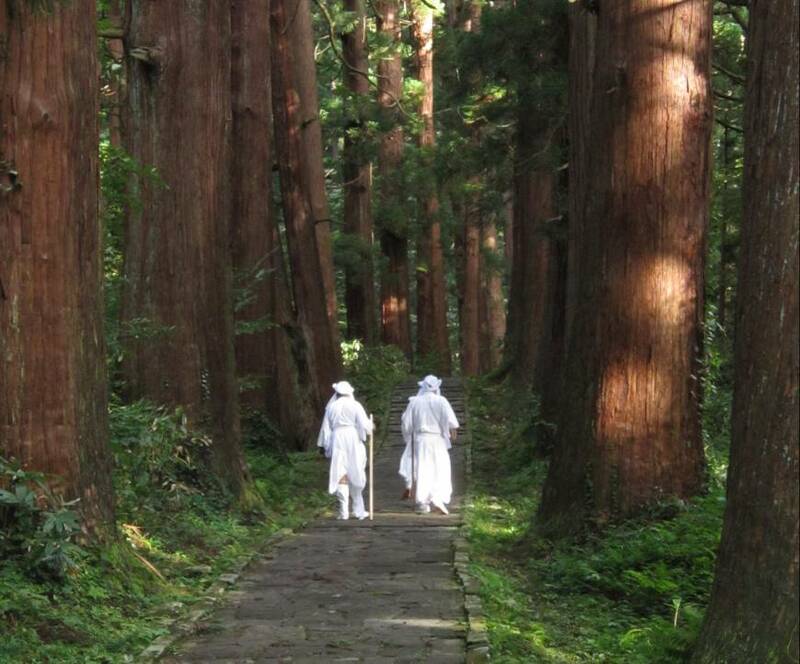 After passing through Zuishin-mon (the Gate of Dual Deities), which marks the start of our journey to spiritual rebirth, we descend stone steps to enter a thick forest. Given the multitude of small and intricately carved wooden shrines, each home to a huge variety of deities, it’s not long before the group fans out to explore. 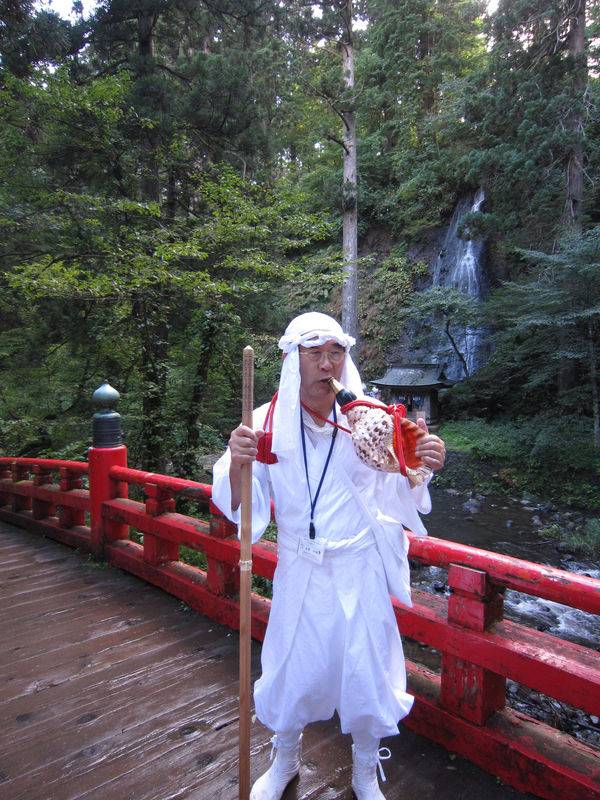 But our yamabushi master is soon blowing his giant conch, signaling us to gather at a bright-red bridge where we see a waterfall alongside a small shrine expertly blended into the forest. 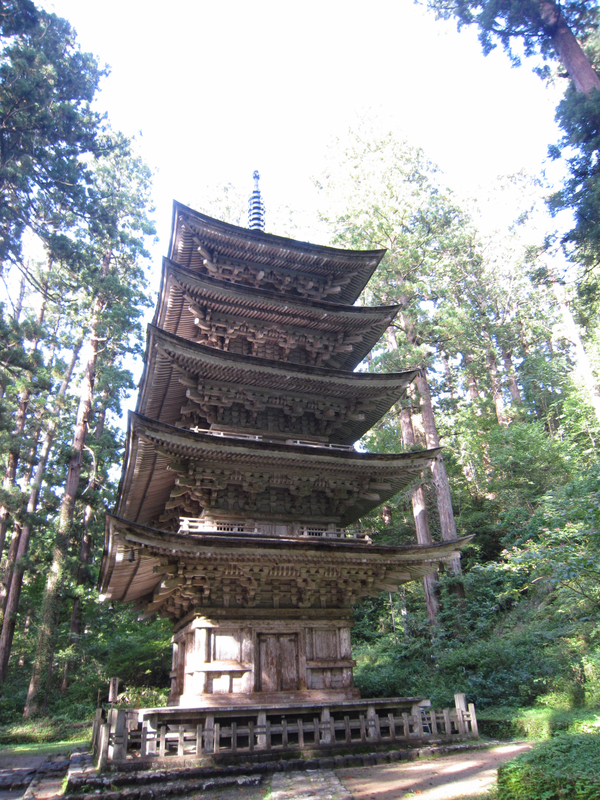 Soon, we reach the oldest pagoda in Tohoku, which is regarded as one of the most beautiful pagodas in Japan. At 30 meters tall, a single column runs through it, but each of its five individual sections is entirely independent. According to our guide, this is the reason it became the structure on which Tokyo’s famed Skytree is based. Invigorated by the sight, we begin to climb, taking the first section of the 2,446-step stone stairway to the summit in our stride. With few other hikers to disrupt the sound of bird song and the breeze rustling through the 580 cedar trees that line the path, it’s a serene experience. Passing under the trees gives a sense of the history of this journey. Most of the cedars are between 300 and 500 years old and, for ultra-perceptive visitors, 33 hand-done engravings can be found in the steps, which are believed to have taken 13 years to build. We find one that looks like a sake cup. 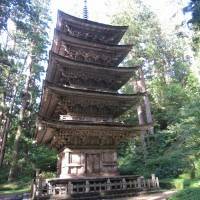 Such is the beauty of the cedar-lined path that it has been dedicated a significant natural monument and awarded three stars in the Michelin Green Guide Japan. Halfway up, we stop at a rest station that has been run by the same family for three generations. Undeterred by the challenging location, they all pitch in to carry supplies up the mountain each day. 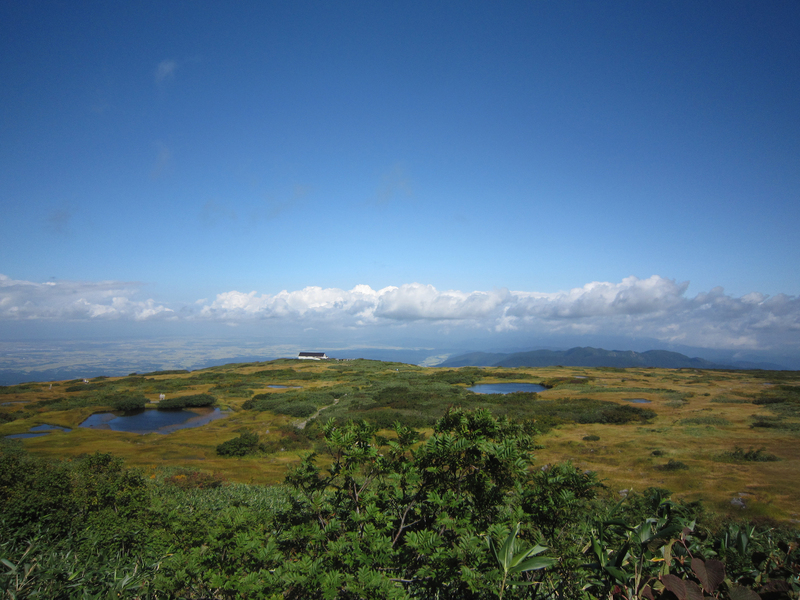 They offer green tea, sweets and a sweeping view, and their cafe is only closed in winter when snow prevents access. At the top, we receive our Shinto yamabushi blessing, comprising chanting, bell ringing and paper swaying, at the main shrine building of Sanjin Gosaiden before descending to our lodging in Toge, the town at the foot of the mountain. For centuries, homes draped with shrine ropes have welcomed pilgrims to the region with accommodation, shōjin-ryōri (vegetarian Buddhist cuisine) and even mountain guides. The second peak of our journey, Mount Gassan, could not be more different than the first. Though known as “the mountain on which ancestors rest,” it’s noticeably devoid of religious artifacts apart from one shrine at its midpoint and another at its summit. Passing wetlands brimming with insects and alpine plants as we snake slowly up the mountainside, it is clear that nature gets priority here. Our path consists of two parallel wooden beams that are raised off the ground to protect the delicate ecosystem and encourage the single-file movement of hikers. As the grasses encroach on the sides, it also proves a great way to camouflage the human impact on this almost 2,000-meter peak. 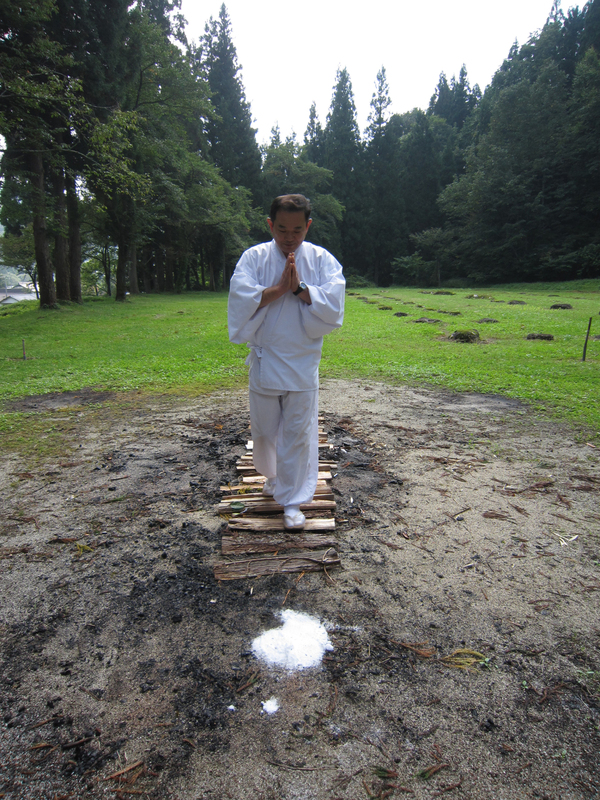 That feeling of being at one with nature appeals to our yamabushi guides. Their reason for spending so much time on mountains such as this one is to let the force of nature and the natural life force in their bodies drive them forward when they encounter problems in their lives. Women, he says, are more gifted at prioritizing feeling over thinking than men, who tend to focus on what they can see. This, along with the general decline in yamabushi across Japan, prompted Hoshino to welcome women to learn under him. Of the fresh faces at the outings, more than half are now women, he says. Another trend is the rise in participants from Japan’s biggest cities. 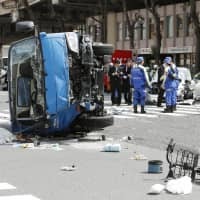 This comes as no surprise to Takeharu Kato, a yamabushi who left his job at marketing giant Hakuhodo to found Megurun Inc., which offers yamabushi experience programs. Kato’s assertion that Shugendo has never been so relevant is food for thought as we set off to the last leg of our journey, Mount Yudono, which is so sacred that photography is not permitted past its giant torii. About 10 minutes’ walk up the path, we reach a small booth where the priest instructs each of us to go barefoot bearing one human-shaped fine paper cutout. Only after rubbing it over our bodies and casting it into a small stream to rid ourselves of impurities are we allowed to enter a special secluded area. In its center is a giant reddish-brown rock, which is believed to contain a deity. Hot spring water spurts out and flows down its side, into which steps have been carved. Gingerly, we climb up the soaking rock to reach a small shrine overlooking the valley, where our journey of spiritual rebirth becomes complete. Reflecting afterward in the nearby sacred foot bath, we agree that at the very least we will leave this place feeling energized. Our journey through Dewa Sanzan, experiencing the tranquility and beauty of the three diverse mountains, and having the privilege of a glimpse at this rare part of Japanese spirituality, has left more of an impression than any of us had expected. 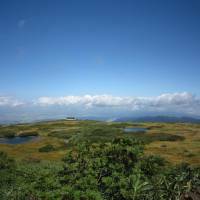 Fly from Haneda Airport in Tokyo to Shonai Airport, or take a shinkansen to Niigata Station before changing onto a Limited Express Inaho train to Tsuruoka Station. 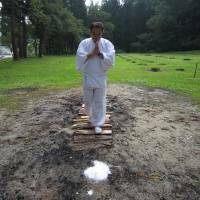 Three- or five-day yamabushi training experiences are available at www.yamabushi.jp. Yamabushi clothes and guides can be rented for a day from Haguro Tourist Association on Saturdays from April to October: www.hagurokanko.jp/en.